A beautiful sunny, still morning greeted the competitors for the penultimate round of the series which saw all the Championships, apart from the EssexFlatPack Super Heavyweights, all finely balanced. No pun intended. Whilton International is a great layout offering multiple overtaking opportunities and unlike some circuits almost all the corners are named. After the start and finish straight the first left hander is called Oblivion, then it’s into a right hander, Crook, before accelerating hard through the Fine Lady kink and on towards the uphill right hander at Christmas which is also the highest point of the circuit. The track then drops away through a left hander and into the fast right at Inkermans before dropping down to the right handed Ashby hairpin. Ashby is followed by the Kenney Straight which runs into the left hander at Parkers followed by the run down into the off camber left right at Chapman’s before the run along the back straight into the left right right of the Boot. A short downhill straight follows before the flat out right hander, Pits bend, takes the drivers over the finish line to complete the lap. It’s fast and was once described by one ex F1 driver as dangerous. Well, every circuit’s dangerous if you don’t drive it properly! 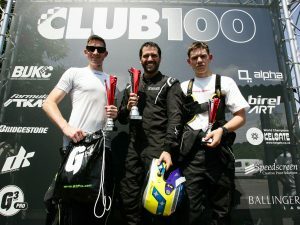 Mark Ridout on pole with Stephen Jennings alongside. Christopher Powell and Paul Jennings shared row two with Simon Lloyd and James Martin next up. 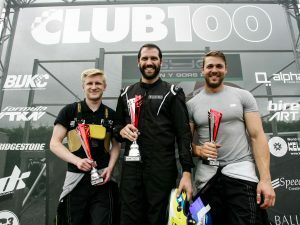 Joint Championship leader Stefan Scully and Darrel Lowe were on row four with Jamie Henderson and the other Championship leader James Taylor sharing row five with the latter desperate to regain his early season form. 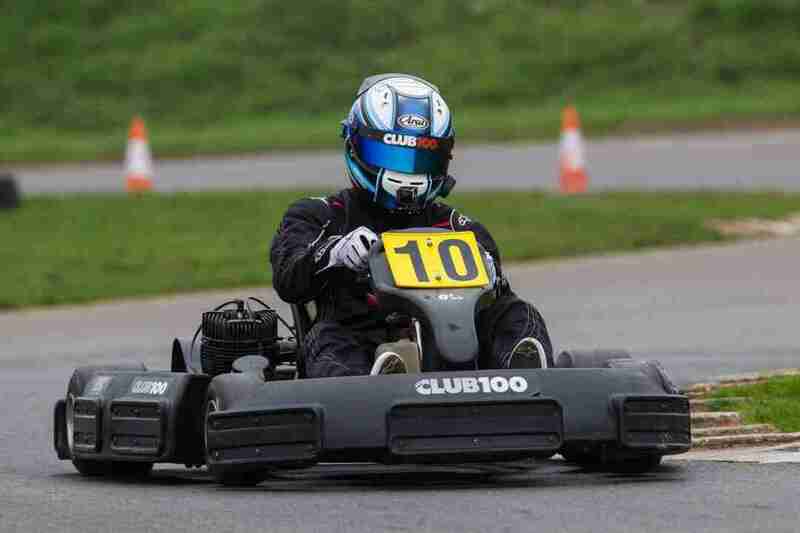 Ridout controlled the pace up to the start to perfection before flooring the throttle to lead by a couple of Kart lengths as the field sped up towards Christmas corner. Powell slipped into second ahead of Stephen Jennings with brother Paul on his bumper. Martin was an early spinner. Down the order Taylor was desperately trying to make up ground but couldn’t break away from the chasing pack. It was a really scrappy affair with drivers getting out of shape all over the place but managing to remain on the track. Taylor dropped to twelfth and just could not seem to make any headway. 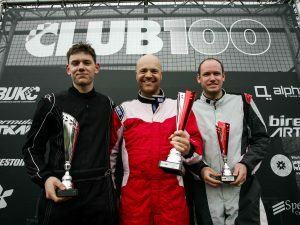 Ridout continued to lead with Powell almost in his wheeltracks whilst Stephen Jennings ran third ahead of Scully who was having to fight very hard to keep the place from a very on form Lowe. 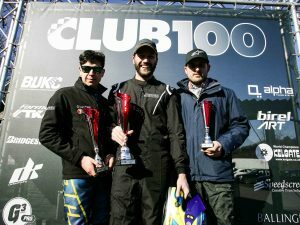 Ridout controlled the pace brilliantly at the front and crossed the line to take the win just under half a second clear of Powell with Stephen Jennings next but penalised down to fifth for exceeding track limits promoting Scully to third from Lowe. 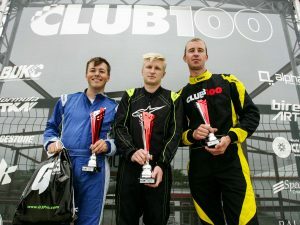 Henderson took sixth after a sensible drive with Freddie Fincham seventh. 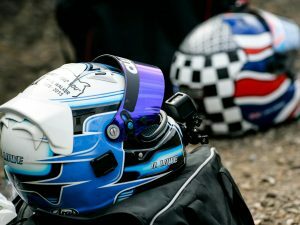 He started on grid sixteen but worked his way quickly forward to ninth after a couple of laps. Two laps later his charge stalled and despite setting fastest lap he couldn’t quite close down Henderson. David Whitehouse was next. He started down on grid thirteen. It was a feisty drive this and from my vantage point he looked a little ragged at times amongst all the bumping and boring that was going off. Luke Austin came home ninth. Another good drive moving up eight places whilst Taylor rounded out the top ten leaving himself with some work to do. 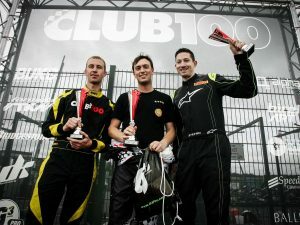 Taylor on pole from Watkins with Andrew Dawson and Whitehouse on row two. Luke Hornsby and Andy Dawson shared row three with Freddie Fincham and Luke Austin on four. Stuart Osborn and Mark Ridout completed the first five rows. Taylor led the field up to start but before the pack reached the start he was already out of the tramlines. He led into the first turn but was lucky to escape sanction. Watkins dropped into second and was shadowing him closely. Down into Ashby for the first time he pulled alongside the leader and moved into the lead. Taylor immediately had to go defensive from Andrew Dawson with Whitehouse fourth from Andy Dawson and Hornsby with Ridout sixth. As Watkins began to pull clear Taylor was putting on a defensive master class. His best lap was the slowest of the seventeen runners but still he hung onto second. Whitehouse forced his way through at Christmas but overshot and lost the place. But the pack was clearly being held up and bunching up. Watkins continued to run clear at the front with Taylor still second from Whitehouse. Then Fincham spun out taking Andrew Dawson with him. Still Taylor remained second as the pack became more and more bunched. With Watkins home free as the field came into the boot for the final time Taylor continued to defend. But he was a little slow out. Into the final corner and Ridout had got inside with Whitehouse alongside and Taylor on the outside. Both ran wide and as they chopped back across the track Taylor appeared to tag Hornsby. Whitehouse jinked right onto the grass with Taylor sideways across the line and from my vantage point just beyond the start finish line I thought I was about to witness a big accident but everyone apart from Austin, who spun down the grass, escaped. Watkins won by over six seconds with Ridout next from the fortunate Taylor. Whitehouse was fourth from Hornsby then Austin from Simon Lloyd, Andy Dawson, Scully, Martin, Lowe and Henderson. Just 0.753 covered second to twelfth. Almost unbelievable! Henderson set the fastest lap and established a class record. Henderson on pole from Osborn with Lowe and Austin on the second row. Scully and Fincham on three from Martin and Andy Dawson on four and Lloyd and Hornsby completing the first five rows. Henderson led the field away with Osborn tucking into second. Lowe lost out over the first lap dropping to seventh leaving Austin third from Scully and Fincham. Hornsby spun to the back of the field courtesy of an over ambitious attempt to pass from Stephen Jennings who would suffer the inevitable post race exclusion. Henderson continued to pull clear aided by the frenetic fight for second. Two laps run and it was Scully in second from Fincham who had forced his way ahead of Austin at Christmas corner whilst Osborn dropped to seventh. Paul Jennings was up to fifth. Having started from grid eleven he’d kept out of trouble and moved up the order. Henderson still led but it was Austin up into second slipping by both Scully and Fincham. 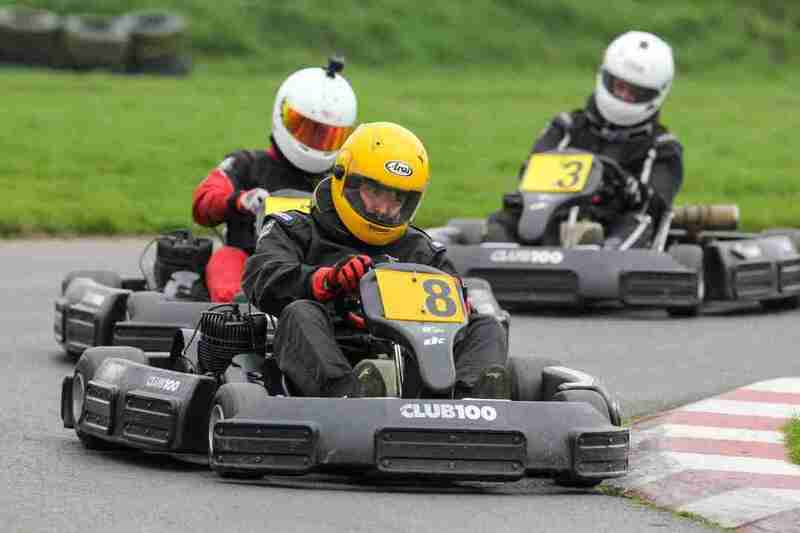 Henderson was gradually extending his lead as Austin defended manfully from Fincham with Scully a kart length behind. And Lowe was up with Scully and giving him an uncomfortable time. Fincham finally got a decent run up the hill and took Austin into Christmas whilst on the same lap Lowe pulled a great move on Scully into Chapman’s to claim fourth. Lloyd also made it by Scully a couple of corners later. Once clear of Austin Fincham began to close in on the leader. Last lap and the leader was a little slow out of Crook. Fincham immediately sensed his opportunity and moved alongside to take the lead into Christmas corner. Henderson had to then defend from Austin which allowed Fincham to pull clear and take the win. Henderson held on for second with Austin third from Lowe. Lloyd was fifth, and set the fastest lap with Paul Jennings sixth and Scully seventh. Osborn, Powell and Whitehouse completed the top ten. Ridout on pole from Austin with Lowe and Scully on row two. Henderson and Whitehouse on three from Powell and Watkins with Taylor and Lloyd on five. Ridout got a great start to lead through the first corners with Lowe getting the better of Austin off the line to move into second. Scully remained fourth. As the pack exited Christmas corner Watkins was forced wide and onto the grass. He did well not to spin and rejoined the circuit after Inkermans dead last. Round Ashby for the first time and Powell got nudged sideways. He too did well to regain control but he lost momentum and ten places. 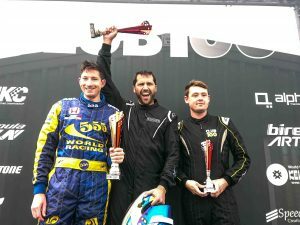 Ridout continued to lead and he and Lowe were beginning to edge away from the battle for third between Austin and Scully. And just a few lengths adrift was Taylor who driven a great first lap to move up to fifth. Paul Jennings too was on fire moving from eleventh to sixth. With three laps run Scully was up to third courtesy of a move on Austin at Christmas. Ridout was having to defend hard from Lowe who was moving all over the track up the hill to find a way by. It took a couple of laps but finally he was just a little bit later on the brakes into Christmas and through into the lead. Taylor, fifth, was desperate not to let the leading group getaway and made a bold move up the inside of Austin at Parker. He almost lost control but recovered well only to have to run defensively over the next few corners to hold the place. 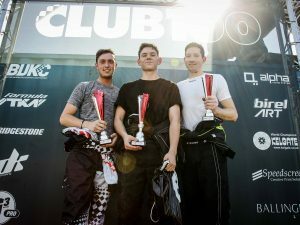 The leaders continued to set a frenetic pace pulling gradually away from fourth placed Taylor who was driving the widest Club 100 Kart ever seen. Down the order Watkins was putting in a stellar drive. From last he was into the top ten just after half distance. As Taylor bottled up the pack it got a little fraught at times in the battles from sixth downwards. 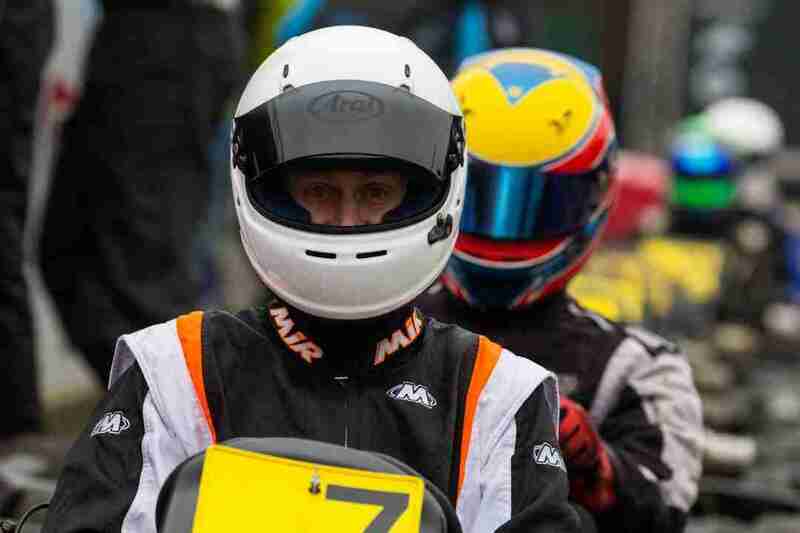 Fincham was looking particularly feisty after fighting his way up from grid fifteen to seventh. Paul Jennings meanwhile got by Austin at Christmas and closed in on Taylor. With the leaders out of reach Taylors pace began to fade and Jennings and the rest of the pack began to close him down. Fincham got by Whitehouse on the penultimate lap and homed in on Jennings for fifth. Last lap and the leaders were separated by inches but Lowe hung on to take his second victory of the season raising his arms aloft as he crossed the line. 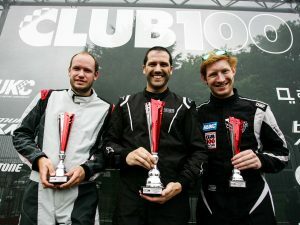 Ridout took second, shyly snaffling the goodie bag of car detailing products from G3 Professional Car Care and Detailing Products from our friends at www.Farecla.com with his trophy, with birthday boy Scully third. Taylor held on to fourth some eight seconds adrift of third placed Scully. But it was chaos at the Boot for the final time. Fincham tried a move on Paul Jennings which failed, taking them both out along with Stephen Jennings who couldn’t take avoiding action. 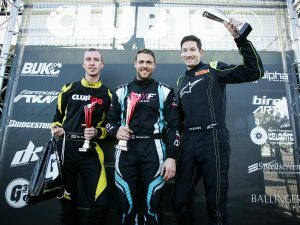 All of which promoted Watkins to fifth after a brilliant comeback drive which also netted him fastest lap and a class record. Whitehouse was sixth with Henderson seventh from Austin. Martin and Hornsby completed the top ten. In the Clubman’s Stefan Scully has extended his lead to eleven points over James Taylor who hasn’t been on the podium since round seven. Stefan has yet to win this year whilst James has five wins to his credit. James feels his weight is putting him at a disadvantage and he’s undoubtedly right. He’s praying for rain at the last round. Well that was an entertaining day wasn’t it? Great weather too. 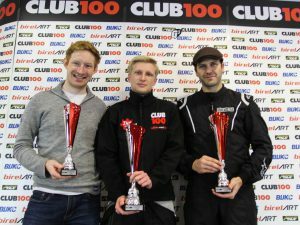 Thanks as always to all the hard working Club 100 staff and marshals’ who do such a great job. And I’m told the live coverage was brilliant. I shall be viewing it tomorrow. 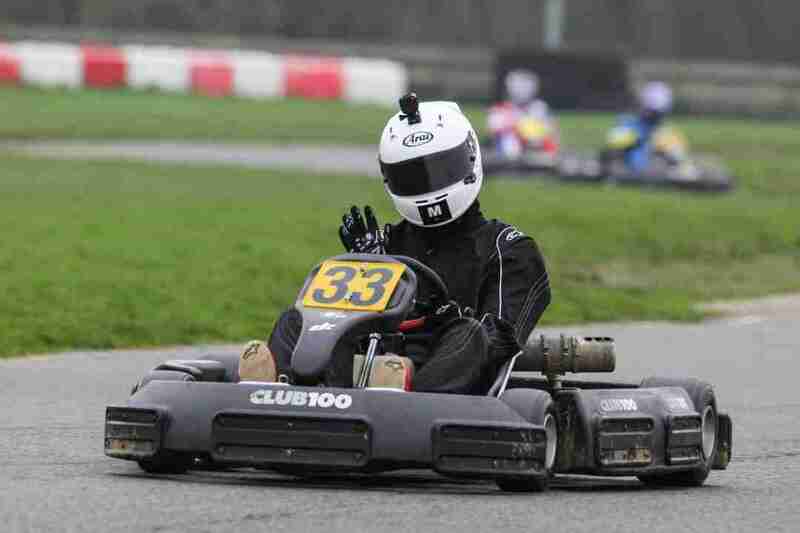 Thanks to Dartford Karting for their support. Apart from the great racing it was noticeable that on too many occasions Jel Dart was having to call out for pushers in the pit lane. When you end your race, if you don’t have to get weighed, step across and help push out. If you need to have a moan about a penalty do it after you’ve pushed out. You might find that if you give yourself a little bit of time to give your head a wobble any complaint might be better viewed if you present your case in a calm manner rather that blowing a fuse at the wrong people. Just saying. See you all at Buckmore for the Championship showdowns. It’s going to be greeaatt! !